Bruxism, or teeth grinding, can ruin a person’s smile. It is a habitual condition that is difficult to stop, especially during times of stress. To prevent permanent damage in your mouth, it is important to uncover a dental treatment that may break this habit. 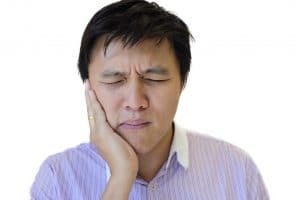 Even though many people grind their teeth to deal with stress or anxiety, a number of individuals do it when they have crooked or missing teeth. Since it often occurs during sleep, a person may not be aware that they are doing it. When a person grinds his or her teeth, it can cause cracks or chips to develop in teeth. It can wear away enamel and lead to tooth loss. Besides visible problems, teeth grinding can lead to jaw pain. The American Dental Association explains that bruxism can be effectively treated in a number of ways. Dental Corrections – When a misaligned bite is to blame, a dentist can perform a cosmetic procedure that evens teeth. Mouthguards – When a person grinds his or her teeth at night, a dentist may fit a patient’s mouth with a guard that is worn during sleep. This device keeps teeth separated to avoid damage caused by grinding. Stress Management – If stress is the cause of bruxism, a person may practice relaxation techniques that keep the jaw from clenching together. Treating Sleep-Related Disorders – Sleep apnea is a condition that often causes bruxism. When a person seeks medical attention for this type of disorder, the grinding is eliminated. If you are looking for a solution to bruxism, it is helpful to consult with your dentist. Dr. Dana Walters can help you stop grinding your teeth and will recommend ways to maximize your oral health. For an appointment, call our office today.